Robotech Hi-Ed SP Toolkit is a suite of tables, reports and routines in ARCHIBUS and Web Central tailored for use by Higher Education institutions, fulfilling their special data tracking requirements, reporting and processes. The Hi-Ed Toolkit works in compliance with post-secondary space classification standards and the Federal OMB Circular A-21 and A-110. The toolkit was designed and developed by Robotech CAD Solutions in cooperation with a number of prominent universities and works in ARCHIBUS, a world-leader Total Infrastructure and Facilities Management (TIFM) System. addition to these ad-on features, Hi-Ed SP Toolkit takes advantage of the already well-structured ARCHIBUS space and organizational tables so that the Toolkit functions seamlessly with the rest of the ARCHIBUS system. The Hi-Ed SP Database that resides at the back-end of the SP Toolkit is preloaded with background data for space classifications such as HEGIS (Higher Education General Information Survey) and FICM (Postsecondary Education Facilities Inventory and Classification Manual) codes; tables necessary for F&A (Facilities and Administrative) cost rate proposal calculations such as Principal Investigator (PI) inventory, Grants, Programs and Funding inventory and functional categories data dictionary to complete functional allocations. These tables are accompanied by analytical space functions and indirect cost recovery forms and reports that provide easy data entry and effective information management. The data dictionary of functional categories is based on FICM/NACUBO and A-21 codes. 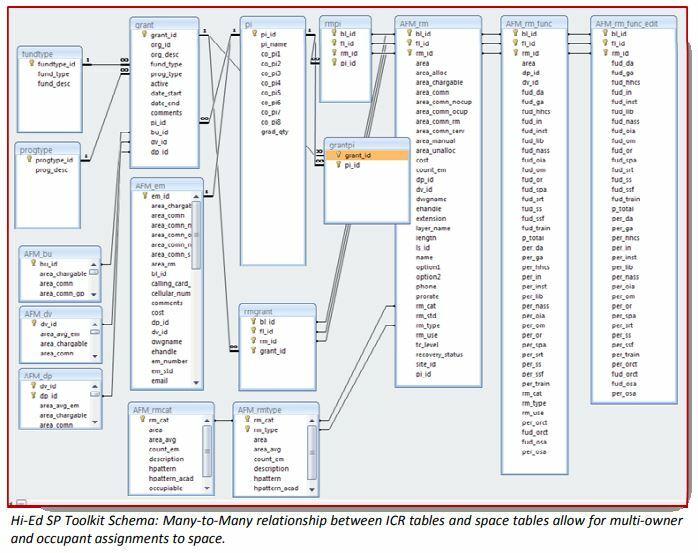 The mash-up of the above-mentioned database elements is achieved via many-to-many table relationships established primarily between space and owner/occupant tables in Hi-Ed SP Toolkit. This, in return, provides a multi-faceted representation of multiple ownership and occupancy in a given space at a granular level, at the same time, allowing for data exchange with university financial and accounting systems. In other words, this schema allows for primary, secondary or more space assignments for personnel or PIs. Ownership and/or occupancy, as well as functional category factors are entered either in terms of percentage (%) values or factors on a scale of 0.0 to 1.0 based on various allocation scenarios. This is done using data entry forms provided with the Toolkit. Once the relevant tables are populated with % or factors, area calculations are computed using the SP Toolkit’s calculation routines. An additional feature of the Toolkit, related to managing personnel/PIs and their locations is through a special personnel location tracking utility which allows for tracking personnel locations and historic trends over time. This is achieved using “Building-Floor-Room” data combinations as well as “move-date” attribute associated automatically with any location change in the database. data query mechanism. Examples to such reports are “Research rooms with no assigned PI”; “Room function totals that are not equal to ‘100’”. One other effective data management and reporting platform available with Hi-Ed SP Toolkit is the CAD Overlay that runs as a plug-in to Autodesk’s AutoCAD software. Originally a module of ARCHIBUS, CAD Overlay allows for reviewing and managing space data graphically on CAD-based floor plans. Owner or occupant assignments to space, in the form of “rooms”, specific inquiries as to who owns or occupies which space, functional categories or space classifications etc. 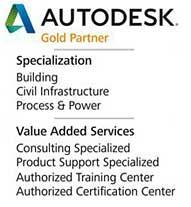 can all be performed in CAD. Additionally, “highlight” reports that are basically graphical and color-coded representations of space usage and departmental allocations can be produced and shared using CAD Overlay. These reports spatially and visually illustrate how resources are allocated throughout the facility floors and provide means to measure ICR distribution as well as KPI values such as $/SQF density for the entire facility. Hi-Ed SP Toolkit is fully integrated with Web Central Indirect Cost Recovery (Web ICR) survey and reporting tool. Data entered via Web ICR for PI, Grant assignments and functional allocations can be directly reviewed and managed with the Toolkit. The Toolkit provides export/import capability to and from external accounting or HR systems using various data interchange formats, including MS Excel, CSV, TXT files. The interchange can be performed based on on-demand transfers or via periodic data transfers scheduled in predefined time intervals. Data exchange between platforms can also serve for establishing integrated logins and effective user authentication throughout the organization. QA (Quality Assurance) Reporting schema to flag data entry exception and allow user corrections, e.g. Research rooms with no assigned PI, Room function total not-equal 0 and more. Integrate employee database with HR system for downloading personnel information and assigning integrating authenticated login.